Who's ready for another Dr. Brain puzzler? It's been almost three years since I played Castle of Dr. 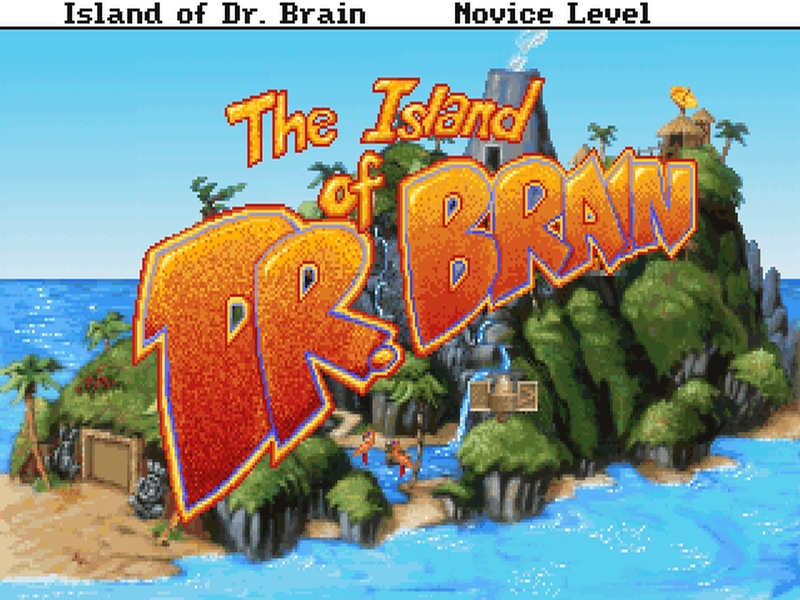 Brain, and now it's time to hit the Island! If the cover is anything to go by, the second game promises to be even crazier than the first. An exploding volcano! Watermelon! Lava lamps! And, of course, more flamingoes. Not to mention puzzles. Did I mention puzzles? Castle of Dr. 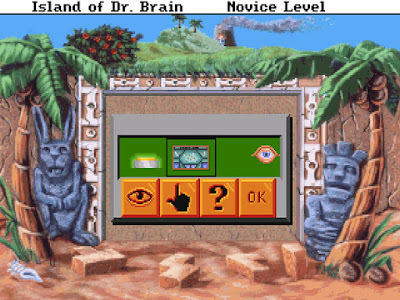 Brain was part of the Sierra Discovery Series, adventure games that were pitched as being more educational than their regular games, but even then it was unusual in being particularly compelling. As I said in my final rating, even though it only scored 46 on our usual scale, it ended up being more than the sum of its parts and very enjoyable. 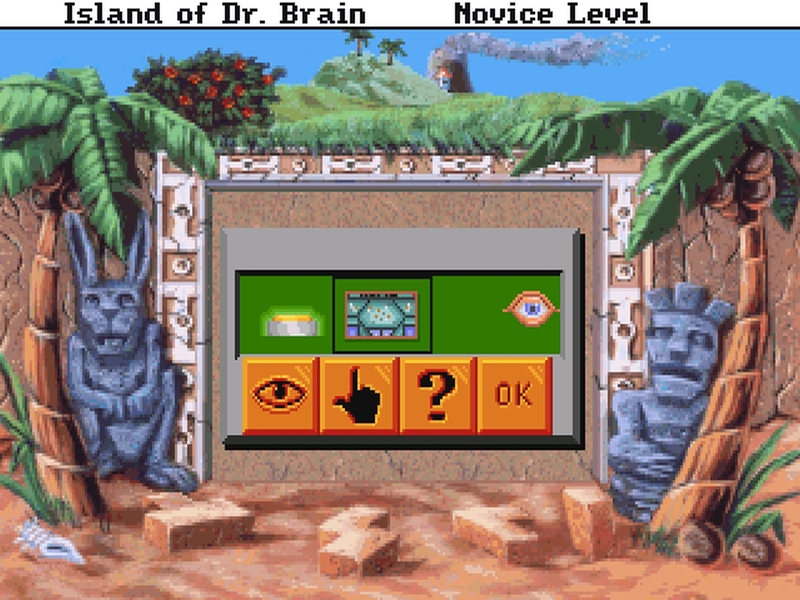 The first-person interaction as a blank protagonist allowed for really transparent puzzling fun, and the Sierra charm (particularly due to the Coles) permeated every screen. The game sold well, which meant that a sequel was rather inevitable. Unfortunately, the Coles were not directly involved with the sequel. The Digital Antiquarian has collected some history about how Corey Cole was required to return to his usual programming role in order to work on Sega Genesis tools, rather than continuing his game designing at that time. Still, some of the usual Sierra crew were involved with the project, so we'll have to see how the two games compare as a result. 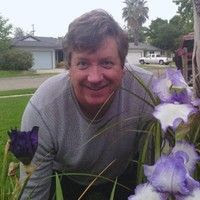 For instance, Brett Miller, who was involved with programming Castle, is credited as producer and director for Island; he also worked on programming for some of the Quest for Glory games. Jon Bock was involved with art for both games, and Robert Atesalp is credited for sound or music on both games. Many of the positions are different, though. In particular, the main designer and writer was Patrick Bridgemon, who has almost no other credits except for the first Police Quest game. He's actually got a current LinkedIn profile, which indicates that after he moved away from Sierra in 1994, he never returned to game design, although he stayed in the field of computer programming and reporting. 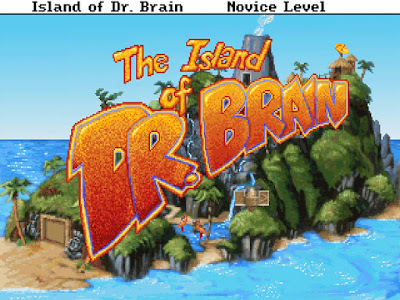 At the end of the first game, you may recall, once the player has solved all of Dr. 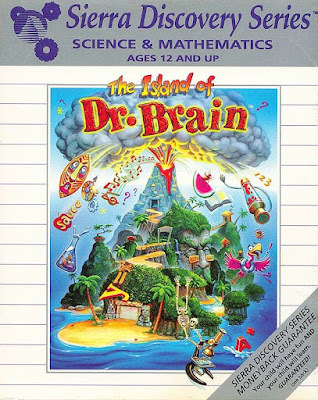 Brain's puzzles, then Dr. Brain offers congratulations as well as an assistantship. And then he disappears to go make more puzzles, which is a rather abrupt way to start a relationship with one's new hire, but it's just par for the course in a game where the plot was only really there as an excuse for the puzzles. What a wacky island. Not quite as strange as on the front cover, though. 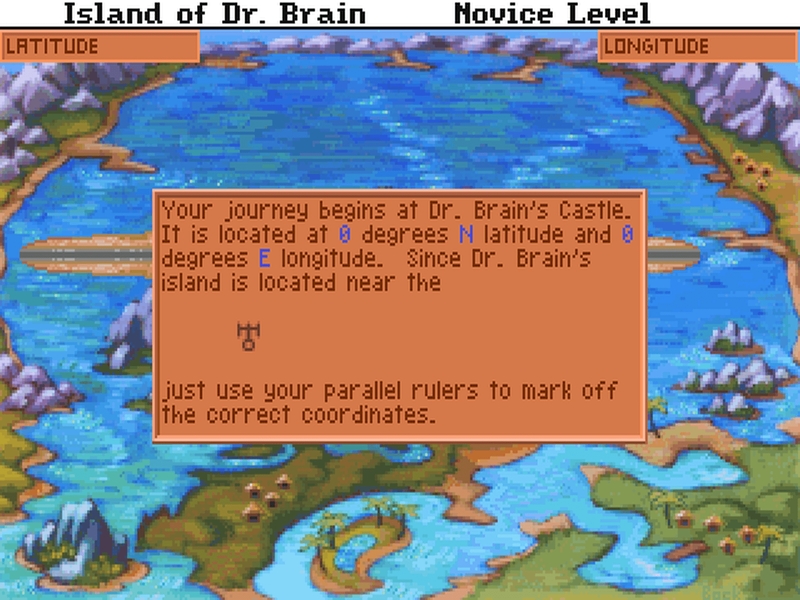 Unlike Castle's curt beginning with a view of a mildly sinister bridge leading up to the castle building, Island has an introductory sequence that sets up a bit of plot: the plans to Dr. Brain's latest project have been stolen, but fortunately they don't mention a critical component: a special battery. 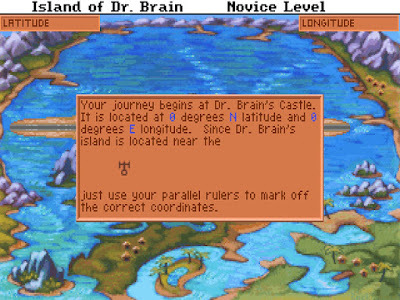 The player's first assignment as Dr. Brain's assistant is to fly to his private island and retrieve this battery. Naturally, it has been hidden behind many puzzles. At higher difficulty levels, the castle's location is not centered on 0,0. The location of the island is the first puzzle and also copy protection, so with the manual, it's pretty simple to give the pilot the correct coordinates for the specified symbol, and off we go! Castle offered "hint coins" that could be used to buy hints, while Island offers "hint calls" using the Hint Watch, which will call Dr. Brain for a strategic hint or part of a solution. Two are available at the beginning, while solving puzzles without hints accrues additional hint calls. Many (all?) of the puzzles are immediately replayable, though, so it's possible for a player who is strong in some areas to accumulate hint calls to use on puzzles in more difficult subject areas. The interface is the same as Castle, with the standard Sierra bar and icons. The player starts with two items: batteries for the hint watch and an Achievement Board, which acts as a detailed scoring mechanism. 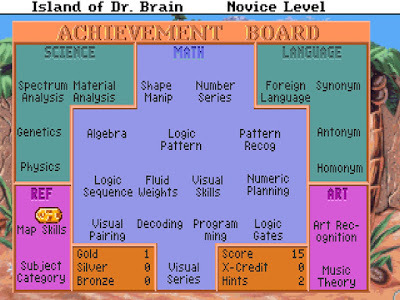 It shows at a glance which types of puzzles have been solved and at what level (bronze = Novice, silver = Standard, gold = Expert), as well as the total score. The bar itself is decorated with palm trees on each side. The board is interesting, but it's rather spoilery to the player, as it names all the different subject areas that the puzzles will cover. In Castle, you didn't get to see all the subject areas until you had to fit them into the grid at the end of the game. Here in Island, it's all visible up front. 26 categories of puzzles, more than half of which are considered math. Another improvement over Castle is that all the puzzles are randomized to some extent, not just the copy protection. While Castle was received well, one complaint was that it was short, with little replayability. So Island's randomized puzzles will offer more replayability, and possibly more interesting puzzles. 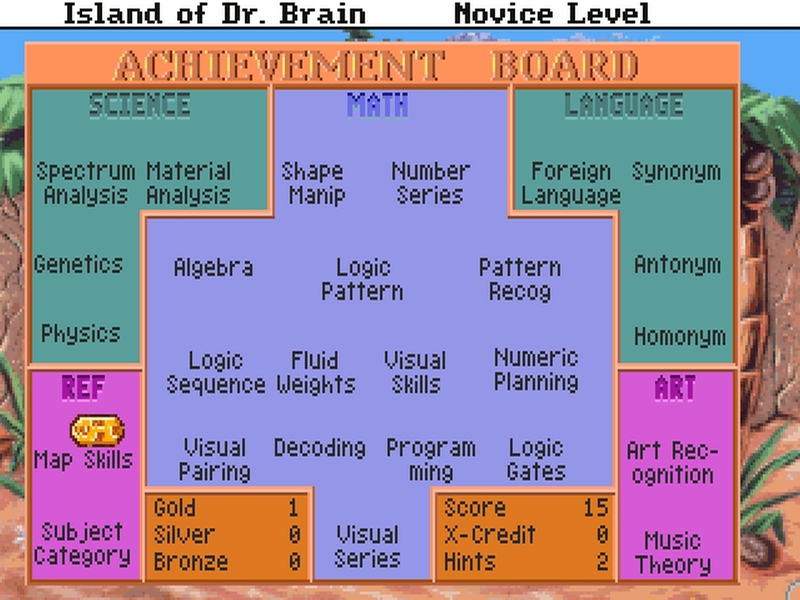 The achievement board keeps track of how many puzzles have been solved at each difficulty, which seems to offer extra points for replaying the puzzles. As with Castle, I'm not going to do journal entries given the faceless protagonist. Likewise, especially since I've played the game before, I'm going to play everything on Expert difficulty, at least for the first time for each puzzle, although I might replay some on other difficulties just to see what that does. And I'll avoid using the hint calls. So next time, we'll dive into the puzzles, starting with the Polyomino Puzzle. If you'd like to play along, you can find the game available on the Internet Archive. Note Regarding Spoilers and Companion Assist Points: There's a set of rules regarding spoilers and companion assist points. Please read it here before making any comments that could be considered a spoiler in any way. The short of it is that no CAPs will be given for hints or spoilers given in advance of me requiring one. As this is an introduction post, it's an opportunity for readers to bet 10 CAPs (only if they already have them) that I won't be able to solve a puzzle without putting in an official Request for Assistance: remember to use ROT13 for betting. If you get it right, you will be rewarded with 50 CAPs in return. It's also your chance to predict what the final rating will be for the game. Voters can predict whatever score they want, regardless of whether someone else has already chosen it. All correct (or nearest) votes will go into a draw. I had just outgrown such games when these came out (at least, in my opinion then) so I never played them, although I saw them in the Sierra catalog. I played this a few years ago for giggles, all went well until the genetics puzzle which completely stumped me. I didn't take biology in high/secondary school so even with Google it was a total crap-shoot. But it was a fun romp nonetheless, going to go for 49, should be slightly better but not a major leap. And yes that cover is very misleading, something that always cheesed me off in my younger days. I'll give a guess of 47 a point higher because the puzzles might be a bit more challenging and interesting, but the rest of the game will probably be about the same. Good luck with your puzzling! LOVE these games. Like Michael, I too was a bit “older” when we got these. My little sister loved them, and honestly at the higher difficulties my 14 year old self found these still a bunch of fun. I'm going to stick with 46, matching the first title. It's a Dr. Brain title, I don't anticipate anything drastically better than the first. Really liked this one as a kid. I'll go with 51. This is one of my favorite games, along Castle of course, the difficulty is a step up from the first one, but very enjoyable. Let's guess 49 - a little higher than the first due to slightly harder puzzles; though I think the theme will end up just being a jumble of half thought through ideas which won't gel together. Will see! 40. I've never played this one, but I'm less optimistic about the series absent its founders. I was given this the year it came out. I still have the manual, which was 10% game information and 90%...everything else. For a kid it was an amazing, fun read. I'm going to guess '51'. I remember leaving the artist puzzle towards the end would produce a hard crash more times than not. Click on the gate and *bam*, game over. Fortunately it didn't always happen, but it occurred more often than not. Usually Sierra games crashed on systems running too quickly, but that was a 16Mhz 386SX. I think you'll have better luck with DOSBox though. I was a big fan of the Dr. Brain series as a kid, especially the first two. I'm a bit torn as to the score, though, as where some of the puzzles are more fun in this installment, others are pretty brutal, and the interface is awfully fiddly at times. Plus Castle has a certain coherence of style to it that's missing here (probably due to the non-involvement of the Coles) so I'm going to go with 44: similar to the first game, but a bit lower due to the frustrating bits. For me the charm of 'Island' is that incoherence. A middle-school kid, such as myself, came away learning a bit about a lot of stuff and the difficulty level scales some of that up to a point that I can't complete the puzzles as an adult. Damn you algebra. I'll guess 46. Exactly the same as the first. I'll pick 42. I only played a little of Island, but I will never forget the review by Charles Ardai (I think it was in CGW, but it might have been in Dragon Magazine) that panned it and said, "Play Castle of Dr. Brain instead." Of course, with the rosy glow of a few decades in between, that was probably very unfair to Patrick and Brett, who did their best to make an entertaining and educational game. Why didn't I design Island? It was basically time and money. Sierra did not want to pay me a royalty or a reasonable flat fee, nor did they want me to design the game during work hours. So I would have had to give up all my evenings and weekends for a year for very little compensation. Was Sierra management right or wrong about that? I feel that series creators should get credit and some reward for their creativity. Others felt that we were coddled and should not get any more than any Sierra employee... and Sierra employees were notoriously underpaid. Anyway, I think Patrick did a pretty good job picking up the reins, but I'm still going to guess that Island will score lower than Castle based on my limited experience and the CGW (Dragon?) review.